I am not sure if I have told you, my beloved blog family, that I call Louisiana home...although I am not currently living there, and that I have a truly enormous extended family. I wasn't born in Louisiana, but it's where my mother's family is from. I moved there as a teenager and swiftly fell in love, both with the State and my now husband. I am enamored with the South, while still holding onto some of my Oregon sensibilities (I am laughing as I write that...). I also married a man with 10 brothers and sisters. So when I got married I went from having one older sister to having more family than I could keep track of...and I love them all dearly. 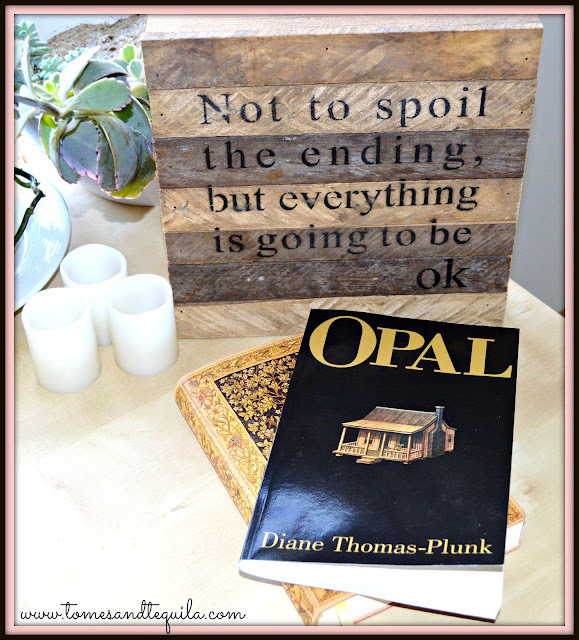 I give you a quick run down of my regional affiliation and enormous familial clan as some pretext to my buying the book Opal by Diane Thomas-Plunk, and my falling head over heels for it after the first chapter. I have a niece who lives in Mississippi currently who is as big of a reader as I am, and she wrote me to say I had to read some of Diane Thomas-Plunk's work...and sent me over to her website. At that time the book wasn't published, but she was sharing short stories and poems on the site, and Nicole thought I might love it as much as she did. I thought they were great...bookmarked the site, and of course promptly forgot about it...like the scatter-brained Aunt that I am. Until Nicole let me know that the author, whose website she had sent me to months before, had a book available to buy. And I snapped it up...because I'm a nice and loving scatter-brained Aunt. The book is comprised of short stories mainly centered around Opal Pratt, a plain woman who never married and lives in her childhood home in rural Mississippi. She's a bit of a recluse who lives a simple life, and doesn't care to deal with people a whole lot. But when she decides she does care, Opal is the woman you want in your corner. We also meet some of the other people in her community, and the folks who weave in and out of her life...from her best friend Billy, the little boy who lives down the street, to Francine, the stripper from New Orleans, whose car breaks down in Opal's driveway. I absolutely fell in love with this book, and I know I probably won't be eloquent enough in my reasons why...but I actually shed a couple tears in the last chapter, if that tells you anything. This book is Southern writing at it's finest. In a way the writing reminds me of Pat Conroy, whose book Prince of Tides I loved so very much. This book is filled with good Southern characters, but none of them are stereotypes or caricatures. It includes all of the things that I love about the South, yet it isn't afraid of showing the flaws. But then again it isn't ONLY about the flaws. And it's just well written. I don't want to give away any of the precious stories because I'd like you to discover them for yourself, but I have to say that I adored when Opal suddenly had a gentleman show up to court her. The story of Lem and his attempts at wooing, for lack of a better word, just killed me. At 184 pages, Opal left me wanting so much more! I was not ready to leave her universe. So many of the characters in this could've had their own books. I want to know what happened to Frances, or Olivia and Levi. I'd love to read more about Pastor Markov. Thomas-Plunk has such an amazing literary voice, and so artistically paints pictures with her words, that I could feel myself being transported to the South that I love so much. I hadn't read a book of short stories since the P.D. James book The Mistletoe Murder, which I gave 5 stars to and reminded me of how good a mystery or detective book could really be. And although a completely different genre, I'm giving this book of short stories 5 stars also. Maybe I need to read more short stories!! If you're a fan of Southern Fiction, I highly recommend picking this one up. And let me know in the comments what you think of short story books in general, as I'd love to know! Be sure to like my Facebook Page for updates and random book tidbits I find online.